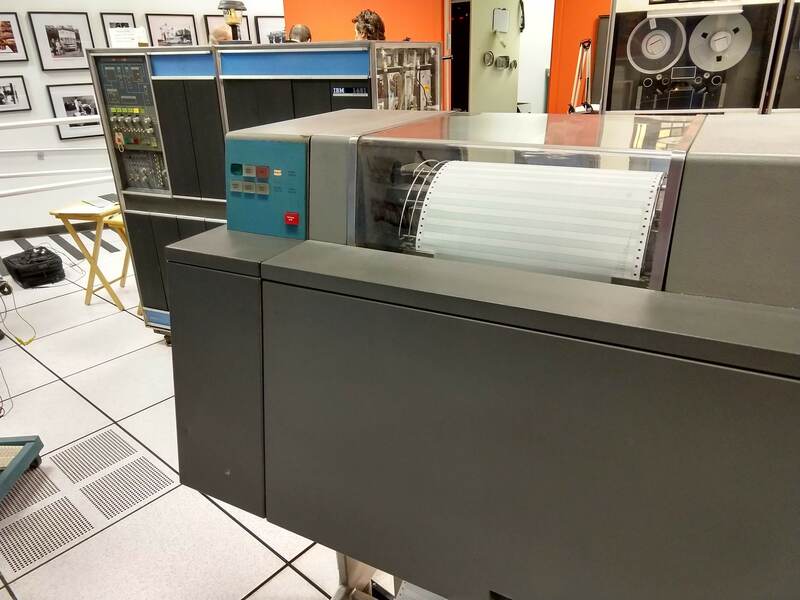 The IBM 1401 business computer was announced in 1959, and went on to become the best-selling computer of the mid-1960s, with more than 10,000 systems in use. A key selling point of the IBM 1401 was its high-speed line printer, the IBM 1403. It printed 10 lines per second with excellent print quality, said to be the best printing until laser printers were introduced in the 1970s. 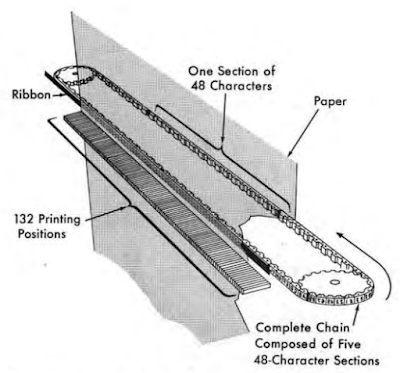 The type chain from the IBM 1401's printer. The chain has 48 different characters, repeated five times. The printer required careful timing to make this process work. The chain spun around at 7.5 feet per second and each hammer had to fire at exactly the right time to print the right character perfectly aligned without smearing. Every 11.1 µs, a print slug lined up with a hammer, and the control circuitry checked if the slug matches the character to be printed. If so, the electromagnet was energized for 1.5 ms, printing the character. While the printer is usually reliable, a few weeks ago the printer stopped working and displayed a "sync check" error on the console. The computer needs to know the exact position of the chain in order to fire the hammers at the right time. If something goes wrong with this synchronization, the computer stops with "sync check" rather than printing the wrong characters. When the sync check light on the printer is illuminated, you have a problem. 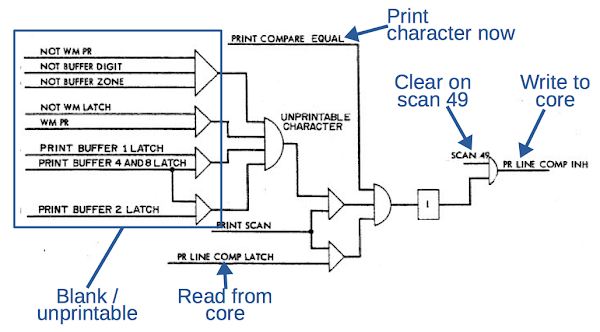 The computer receives these pulses from the printer and generates a logic signal that increments counters to keep track of the chain's position. The schematic below shows part of the circuitry inside the computer, starting with the sense amplifier signal from the printer at the left. 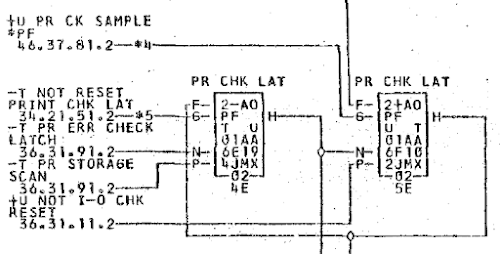 Don't try to understand this circuit; I just want to show the strange schematic symbols that IBM used in the 1960s. The box with "I" is an inverter. The triangle is an AND gate. The semicircle that looks like an AND gate is actually an OR gate. The large box with a "T" is a trigger, IBM's name for a flip-flop. The "SS" box is a "single shot" that creates a 400µs pulse; this detects the double pulse that indicates the chain's "home" position. Excerpt from the 1401 Intermedia Level Diagrams (ILD) showing the chain detection circuitry. To track down the problem, we removed the printer's side panel to access the two amplifier circuit boards, which are visible below. We probed the boards with an oscilloscope. The first amplifier stage (on the right) looked okay, but the second stage (on the left) had problems. In the photo below, the computer is at the back, mostly hidden by the printer. 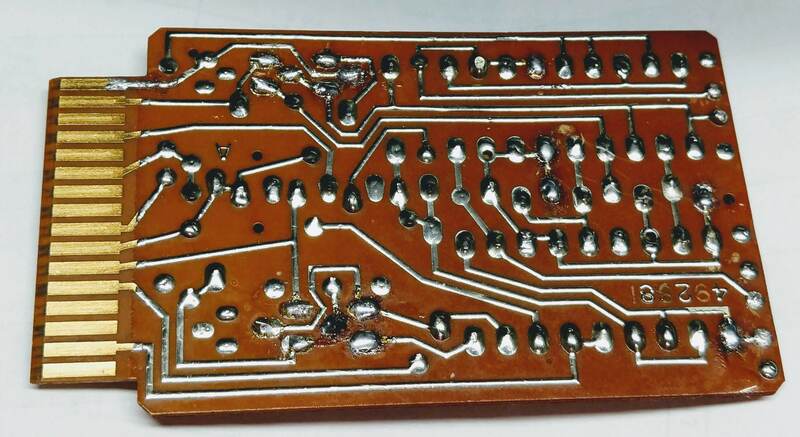 We took the side panel off the 1403 printer to reveal the circuit boards. We hooked an oscilloscope up to the front board to test it. The trace below shows what should happen. 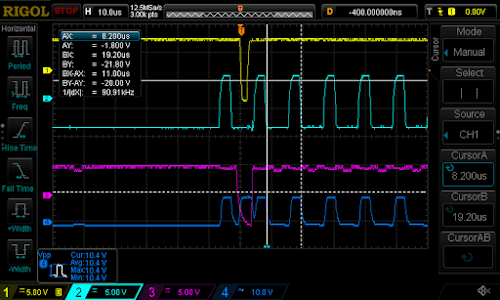 The board receives a differential signal at the bottom, with alternating cyan and pink signals. The difference between these signals (middle) is amplified to produce the clean, uniform pulse train at the top. Note the double pulse in the middle indicating the chain's home position. Oscilloscope trace from a working printer. But when we measured the signal, we saw signals that were entirely garbled. 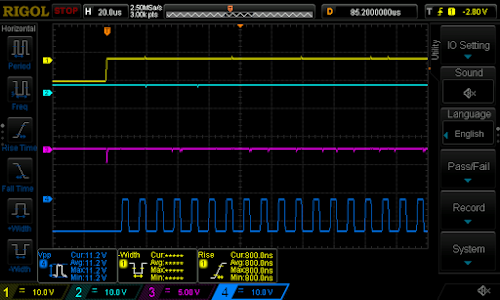 The differential signals at the bottom are a mess, and track each other rather than alternating. 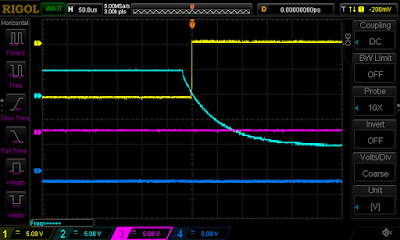 The output signal (top) is basically random. With this signal from the printer, the computer couldn't keep track of the chain position and the sync check error resulted. Oscilloscope trace from the faulty printer. We swapped the board with the board from the other, working printer, and verified that the board was the problem. 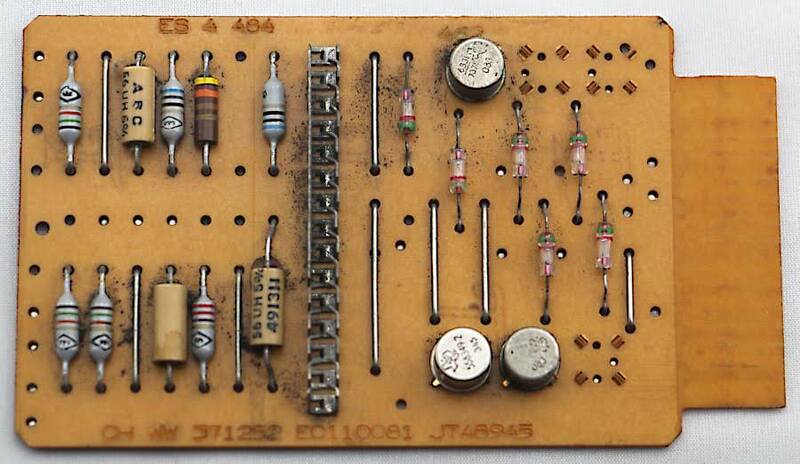 The museum has a filing cabinet full of replacement circuit boards, but unfortunately not a replacement for this "WW" amplifier board. Instead, we had to diagnose the problem with this card and repair it. On the board below you can see the diodes (small gray cylinders), capacitors (silver cylinders), resistors (striped cylinders and large tan cylinders), and germanium transistors (round metal cans). 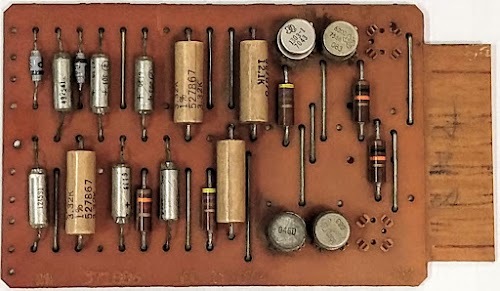 The transistors are germanium transistors as the 1401 predated silicon transistors. The "WW" differential amplifier card used by the printer. We used a vintage HP transistor curve tracer to test the transistors. 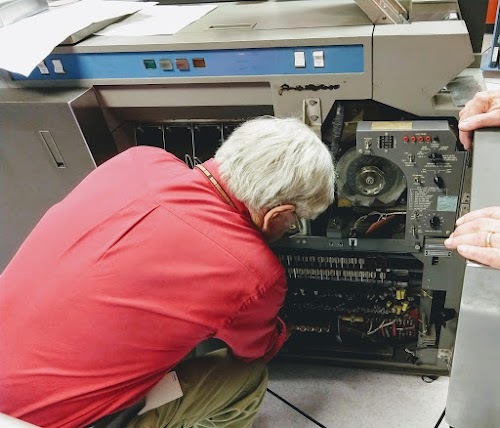 Back at the Computer History Museum, we tested out the repaired board and the printer still didn't work. Even worse, smoke started coming from the back of the printer! I quickly shut off the system as an acrid smell surrounded the printer. I expected to see a blackened transistor on the board, but it was fine. I examined the printer but couldn't find the source of the smoke. I decided to test the board outside the printer by feeding in a 2kHz test signal, but the measurements didn't make sense. The board seemed to be ignoring one of the inputs, so I tested that input transistor but it was fine. Next I checked the diodes, capacitors and resistors again; all the components tested okay, but the board still mysteriously failed. I started carefully measuring voltages at various points in the circuit but the signals didn't make sense and weren't consistent. Since all the components were fine but the board didn't work, I was starting to losing confidence in electronics. 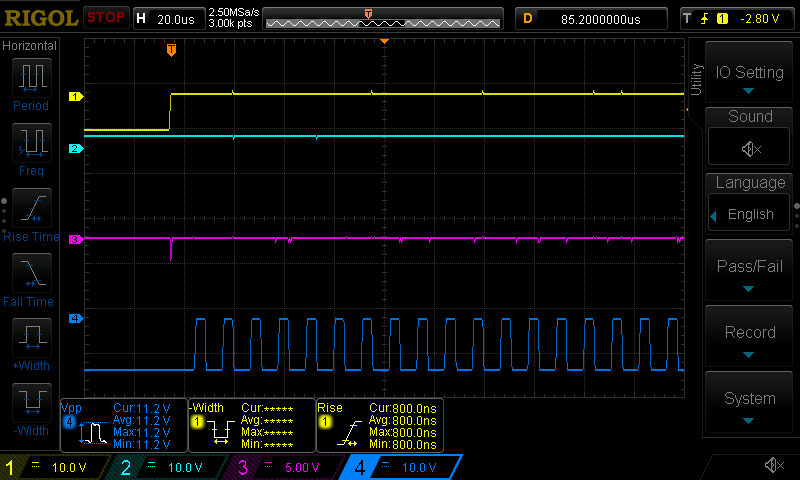 Eventually, I nailed down a signal that randomly jumped between 10 volts and 1 volt. After wiggling all the components, I finally noticed that the voltage jumped if I flexed the board. Finally, I had an answer: a cracked trace on the circuit board between the input and the transistor was making intermittent contact. 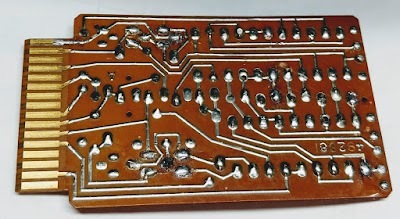 The board had a cracked trace in the upper left, connecting the upper gold contact. Carl put a wire jumper across the bad section. To fix the board, Carl put a wire bridge across the bad trace6. We put the board in the printer, and the printer mostly worked. However, when the printer tried to print in column 85, the column failed to print and the printer stopped with an error.5 More testing revealed four columns of the printer were failing to print due to hammer problems. Each electromagnetic hammer coil is driven by a 60 volt, 5 amp pulse for 1.5 milliseconds. This is a lot of power (300 watts), so if anything goes wrong, hammer coils can easily burn up. We swung open one of the computer's "gates" (lower left), revealing the cards that drive the printer. We looked at the printer driver cards inside the computer. Each card generates pulses for two hammers, so there are 66 of these cards. In the photo below, you can see the two large high-current transistors at the left that generate the pulses. (Note the felt insulators on top of these transistors. Due to their height, the transistors pose a risk of shorting against the bottom of the neighboring card.) 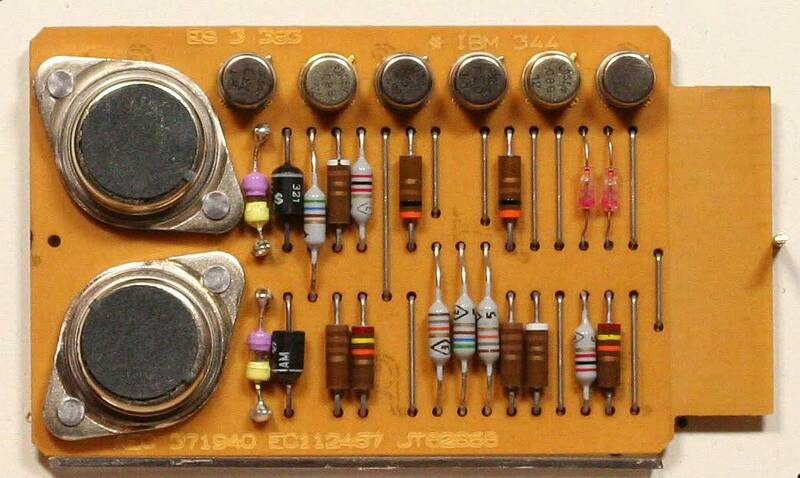 Just to the right of these transistors are two colorful purple and yellow fuses. In the event of a fault, these fuses are supposed to burn out and protect the hammer coils. 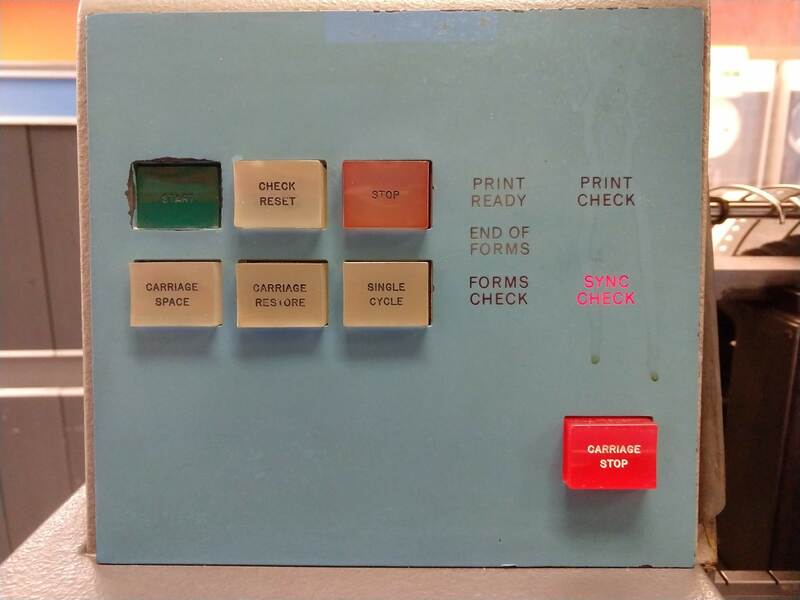 We checked the cards associated with the four bad columns on the printer and found four burnt-out fuses. The "AEC" Alloy-Hammer Driver Latch card produces high-current pulses to drive the printer hammer coils. Why did the fuses blow? The circuit to drive the hammer coils is a bit tricky. Every 11 microseconds, a hammer lines up with a character slug and can be fired. But when a hammer is fired, the coil needs to be activated for about 1.5 ms, a much longer time interval. To accomplish this, the hammer driver latches on when a hammer is fired. Later in the print cycle, the hammer driver is turned off. This process is controlled by the chain position counters, which are driven by the pulses from the chain sensor, the same pulses that were intermittent. Thus, if the computer received enough pulses to start printing a line, but then the pulses dropped out in the middle of the line, hammer drivers could be left in the on state until the fuse blows. This explained the problem that we saw. After Carl replaced the fuses, the printer worked fine except for two problems. First, characters in column 85 were shifted slightly so the text was slightly crooked. Frank explained that the hammer in this column must be moving a bit too slow, hitting the chain after it had moved past its position. This explained the smoke: in the time it took the fuse to blow, the coil must have overheated and been slightly damaged. We'll look into replacing this coil next week. The second problem was that the printer's Ready light didn't go on. This turned out to be simply a bad light bulb, unrelated to the rest of the problems. In any case, the printer was working well enough for demos so the repair was a success. 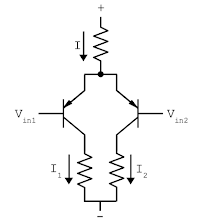 The basic differential pair circuit for a differential amplifier is shown above. 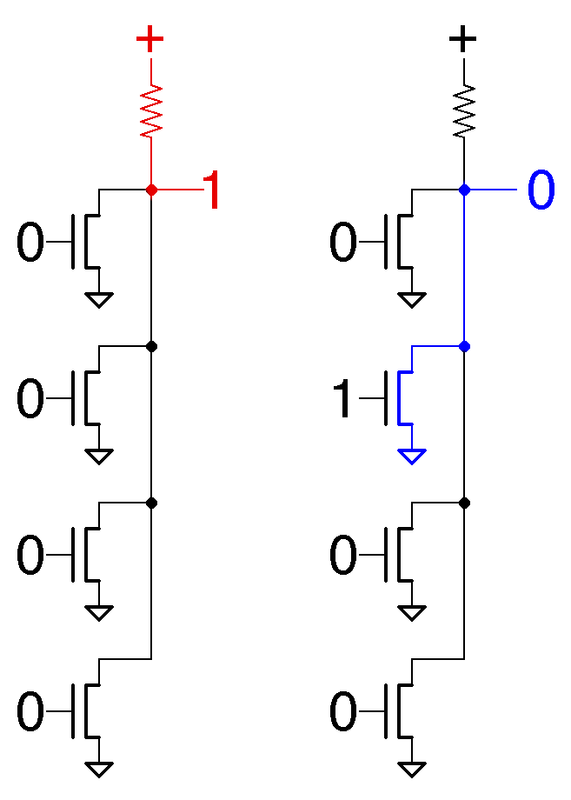 (Op amps contain a similar differential pair.) The resistor at the top sets a fixed current I. 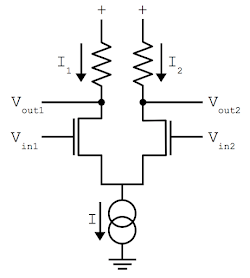 If the two inputs are equal, the current will be split, with half going through each transistor and branch resistor. 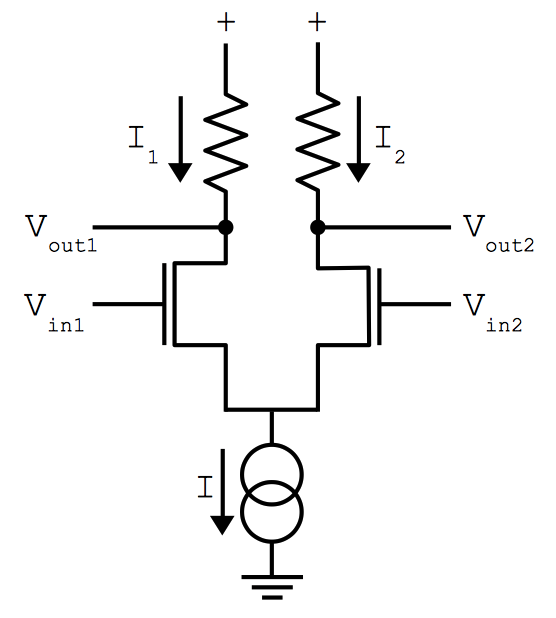 But if one if the inputs is slightly lower, that transistor will conduct more and most of the current will go through that branch. 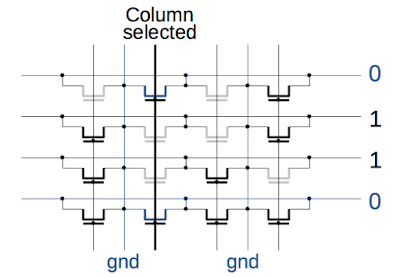 Thus, the difference between the inputs steers the current down one side or the other, yielding an amplified signal across the lower resistors. Schematic of the WW amplifier board from the SMS documentation. 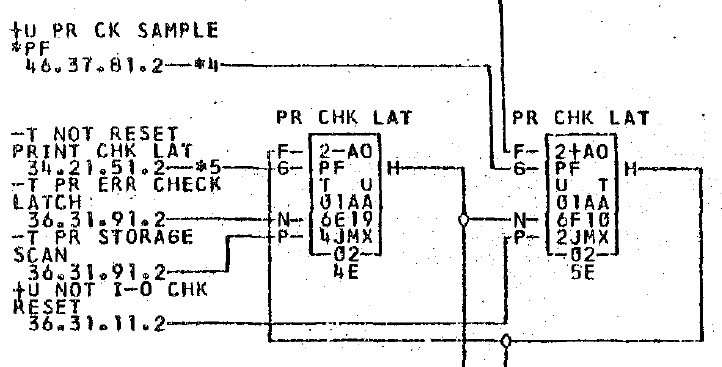 The IBM 1401 documentation provides the schematic above for the board, but it's hard to follow what's happening. (Note the unusual transistor symbol, three boxes with an emitter arrow in or out.) 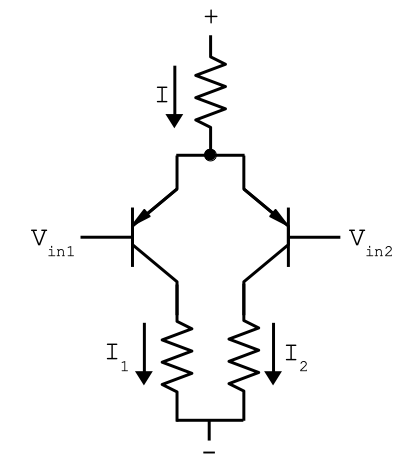 I redrew the main part of the circuit below, so it resembles the simple differential pair. It has the same resistors at top and bottom as the differential pair, but there is an R-C circuit in each branch. 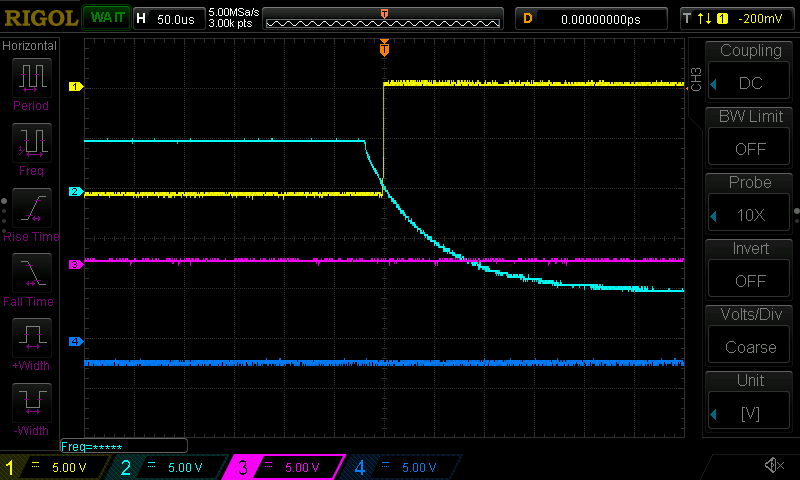 To simplify, if there is a DC offset or low-frequency input, the capacitor will charge and counteract this offset. Thus, the amplifier operates as a high-pass amplifier; it cuts out low-frequency noise while amplifying the 1800 Hz sync pulses. The diodes clip the output, yielding a square wave. The differential output goes through emitter-follower buffers (omitted below) so the signal is strong enough to be transmitted through an under-floor cable from the printer to the computer. 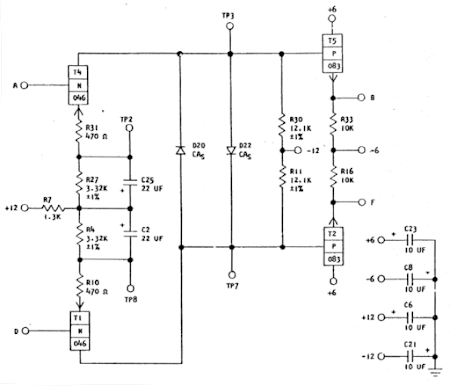 The differential amplifier circuit of the WW card. 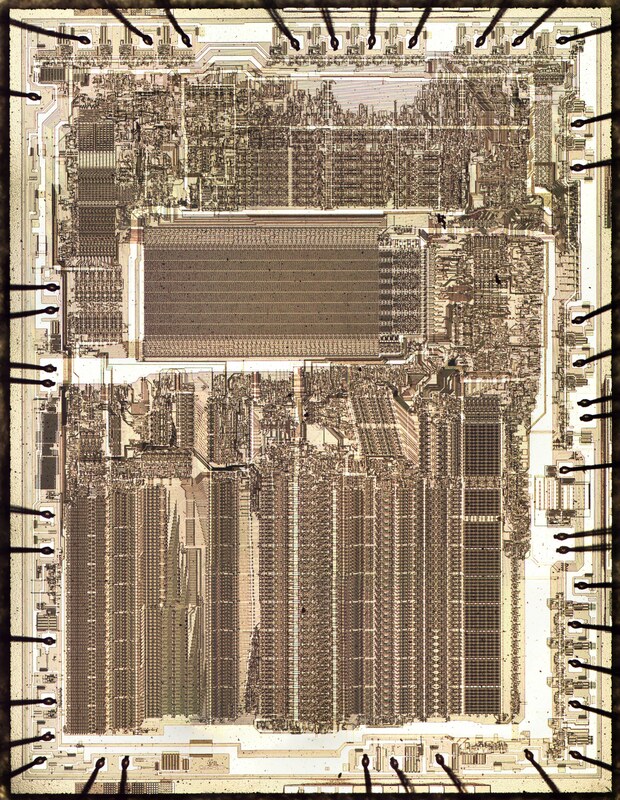 The 8087 chip provided fast floating point arithmetic for the original IBM PC and became part of the x86 architecture used today. One unusual feature of the 8087 is it contained a multi-level ROM (Read-Only Memory) that stored two bits per transistor, twice as dense as a normal ROM. Instead of storing binary data, each cell in the 8087's ROM stored one of four different values, which were then decoded into two bits. Because the 8087 required a large ROM for microcode1 and the chip was pushing the limits of how many transistors could fit on a chip, Intel used this special technique to make the ROM fit. In this article, I explain how Intel implemented this multi-level ROM. Intel introduced the 8087 chip in 1980 to improve floating-point performance on the 8086 and 8088 processors. Since early microprocessors operated only on integers, arithmetic with floating point numbers was slow and transcendental operations such as trig or logarithms were even worse. Adding the 8087 co-processor chip to a system made floating point operations up to 100 times faster. The 8087's architecture became part of later Intel processors, and the 8087's instructions (although now obsolete) are still a part of today's x86 desktop computers. I opened up an 8087 chip and took die photos with a microscope yielding the composite photo below. The labels show the main functional blocks, based on my reverse engineering. (Click here for a larger image.) 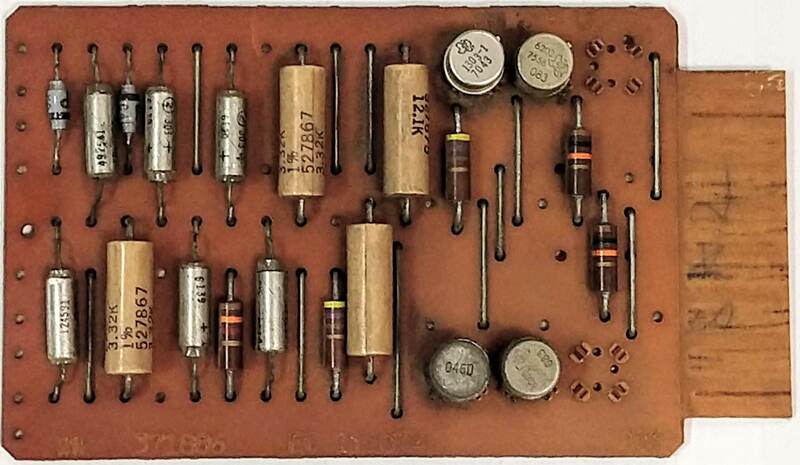 The die of the 8087 is complex, with 40,000 transistors.2 Internally, the 8087 uses 80-bit floating point numbers with a 64-bit fraction (also called significand or mantissa), a 15-bit exponent and a sign bit. (For a base-10 analogy, in the number 6.02x1023, 6.02 is the fraction and 23 is the exponent.) At the bottom of the die, "fraction processing" indicates the circuitry for the fraction: from left to right, this includes storage of constants, a 64-bit shifter, the 64-bit adder/subtracter, and the register stack. Above this is the circuitry to process the exponent. An 8087 instruction required multiple steps, over 1000 in some cases. The 8087 used microcode to specify the low-level operations at each step: the shifts, adds, memory fetches, reads of constants, and so forth. You can think of microcode as a simple program, written in micro-instructions, where each micro-instruction generated control signals for the different components of the chip. 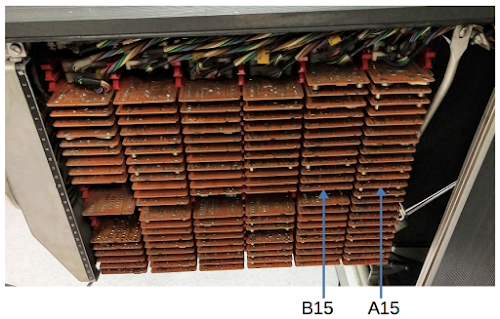 In the die photo above, you can see the ROM that holds the 8087's microcode program. 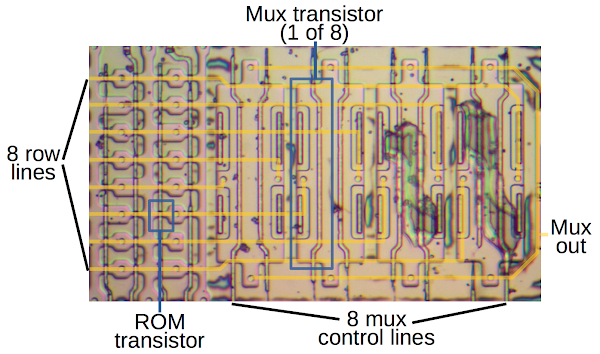 The ROM takes up a large fraction of the chip, showing why the compact multi-level ROM was necessary. 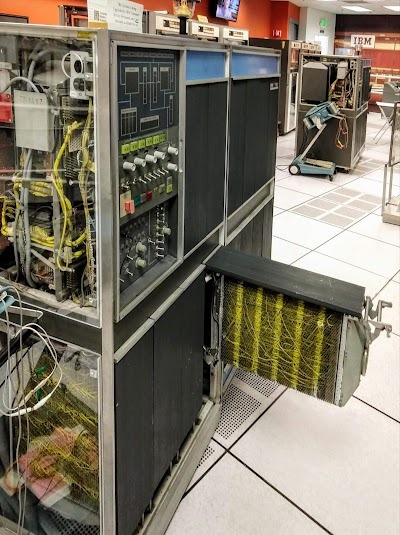 To the left of the ROM is the "engine" that ran the microcode program, essentially a simple CPU. The 8087 operated as a co-processor with the 8086 processor. 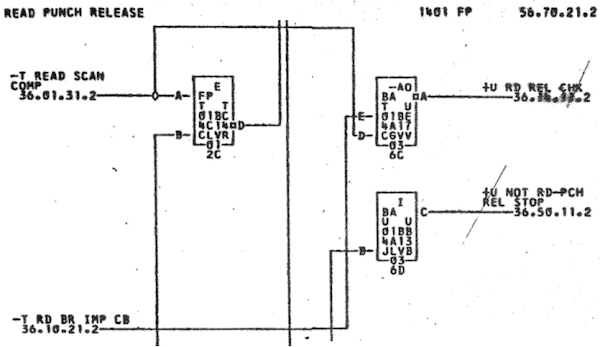 When the 8086 encountered a special floating point instruction, the processor ignored it and let the 8087 execute the instruction in parallel.3 I won't explain in detail how the 8087 works internally, but as an overview, floating point operations were implemented using integer adds/subtracts and shifts. To add or subtract two floating point numbers, the 8087 shifted the numbers until the binary points (i.e. the decimal points but in binary) lined up, and then added or subtracted the fraction. Multiplication, division, and square root were performed through repeated shifts and adds or subtracts. Transcendental operations (tan, arctan, log, power) used CORDIC algorithms, which use shifts and adds of special constants, processing one bit at a time. The 8087 also dealt with many special cases: infinities, overflows, NaN (not a number), denormalized numbers, and several rounding modes. The microcode stored in ROM controlled all these operations. While there are many ways of building a ROM, a typical way is to have a grid of "cells," with each cell holding a bit. Each cell can have a transistor for a 0 bit, or lack a transistor for a 1 bit. 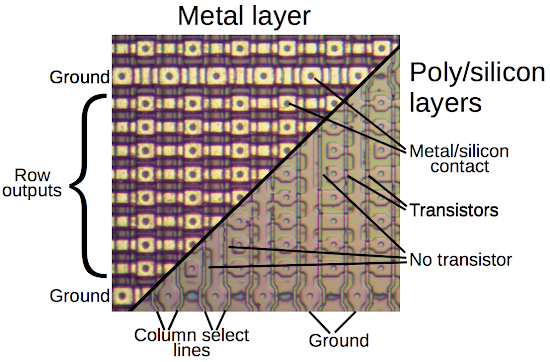 In the diagram above, you can see the grid of cells with transistors (where silicon is present under the polysilicon) and missing transistors (where there are gaps in the silicon). To read from the ROM, one column select line is energized (based on the address) to select the bits stored in that column, yielding one output bit from each row. You can see the vertical polysilicon column select lines and the horizontal metal row outputs in the diagram. 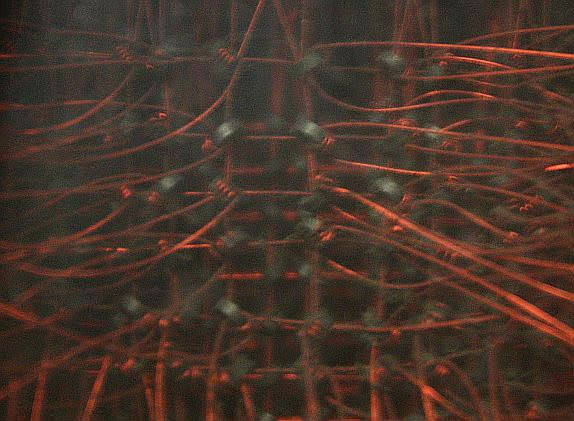 The vertical doped silicon lines are connected to ground. The column select signals are generated by a decoder circuit. Since this circuit is built from NOR gates, I'll first explain the construction of a NOR gate. The schematic below shows a four-input NOR gate built from four transistors and a pull-up resistor (actually a special transistor). On the left, all inputs are 0 so all the transistors are off and the pull-up resistor pulls the output high. On the right, an input is 1, turning on a transistor. The transistor is connected to ground, so it pulls the output low. 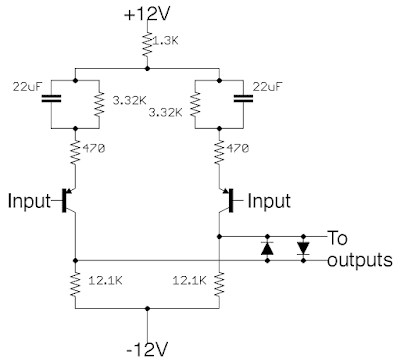 In summary, if any inputs are high, the output is low so this circuit implements a NOR gate. The column select decoder circuit takes the incoming address bits and activates the appropriate select line. The decoder contains an 8-input NOR gate for each column, with one NOR gate selected for the desired address. 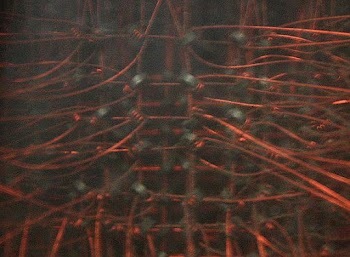 The photo shows two of the NOR gates generating two of the column select signals. (For simplicity, I only show four of the 8 inputs). Each column uses a different combination of address lines and complemented address lines as inputs, selecting a different address. The address lines are in the metal layer, which was removed for the photo below; the address lines are drawn in green. 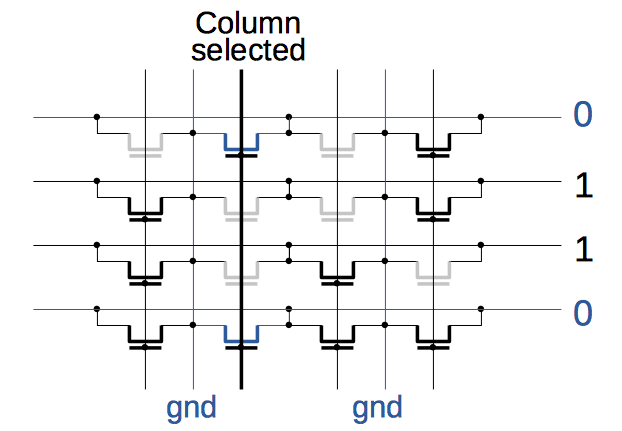 To determine the address associated with a column, look at the square contacts associated with each transistor and note which address lines are connected. If all the address lines connected to a column's transistors are low, the NOR gate will select the column. 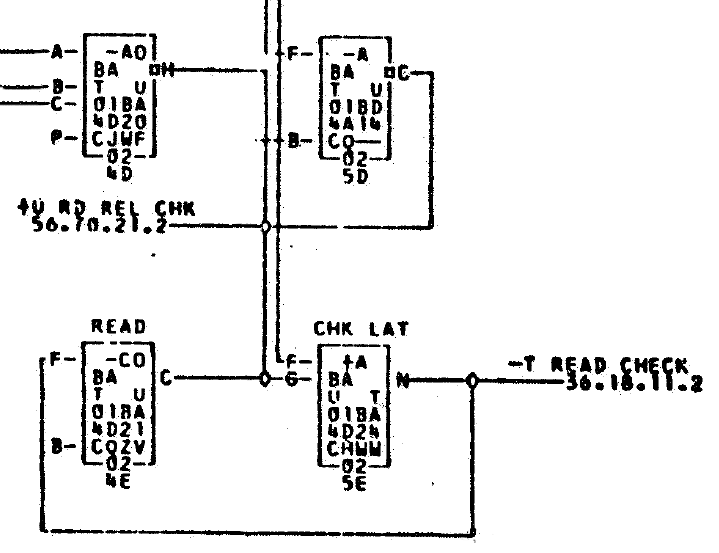 Part of the address decoder for the 8087's microcode ROM. The decoder converts an 8-bit address into column select signals. The discussion so far explained of a typical ROM that stores one bit per cell. So how did 8087 store two bits per cell? If you look closely, the 8087's microcode ROM has four different transistor sizes (if you count "no transistor" as a size).6 With four possibilities for each transistor, a cell can encode two bits, approximately doubling the density.7 This section explains how the four transistor sizes generate four different currents, and how the chip's analog and digital circuitry converts these currents into two bits. 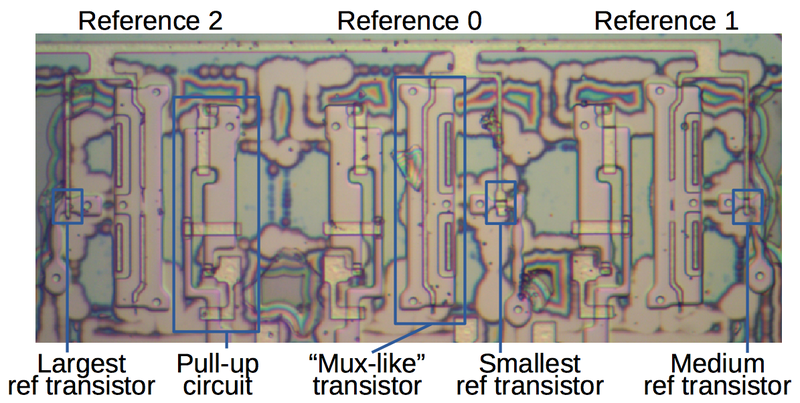 A closeup of the 8087's microcode ROM shows four different transistor sizes. This allows the ROM to store two bits per cell. The circuit above performs these conversion steps. 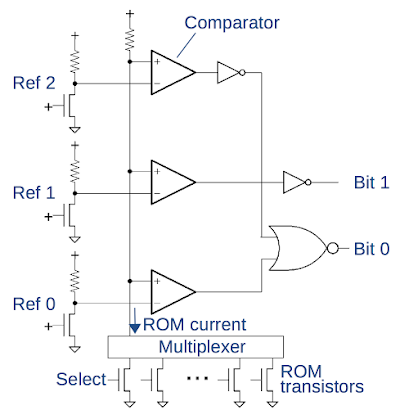 At the bottom, one of the ROM transistors is selected by the column select line and the multiplexer (discussed earlier), generating one of four currents. Next, a pull-up resistor12 converts the transistor's current to a voltage, resulting in a voltage depending on the size of the selected transistor. The comparators compare this voltage to three reference voltages, outputting a 1 if the ROM voltage is higher than the reference voltage. The comparators and reference voltages require careful design because the ROM voltages could differ by as little as 200 mV. 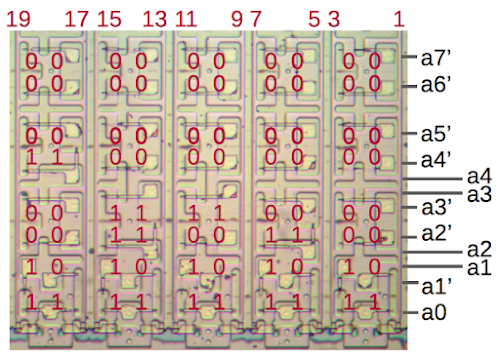 The photo below shows one of the comparators on the chip; the metal layer is on top, with the transistors underneath. I'll just discuss the highlights of this complex circuit; see the footnote12 for details. The signal from the ROM and multiplexer enters on the left. 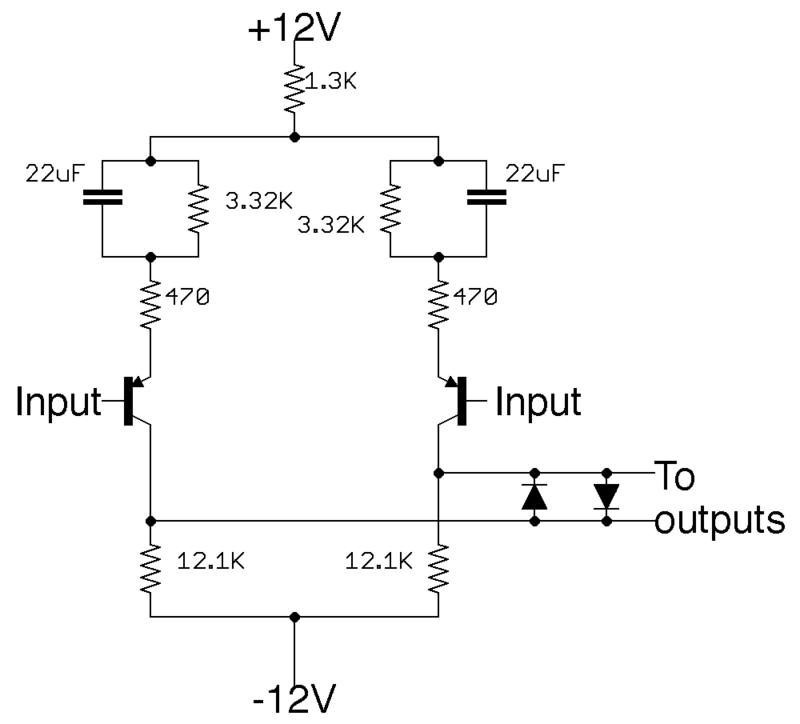 The pull-up circuit12 converts the current into a voltage. The two large transistors of the differential amplifier compare the ROM's voltage with the reference voltage (entering at top). The outputs from the differential amplifier go to the latch circuitry (spread across the photo); the latch's output is in the lower right. 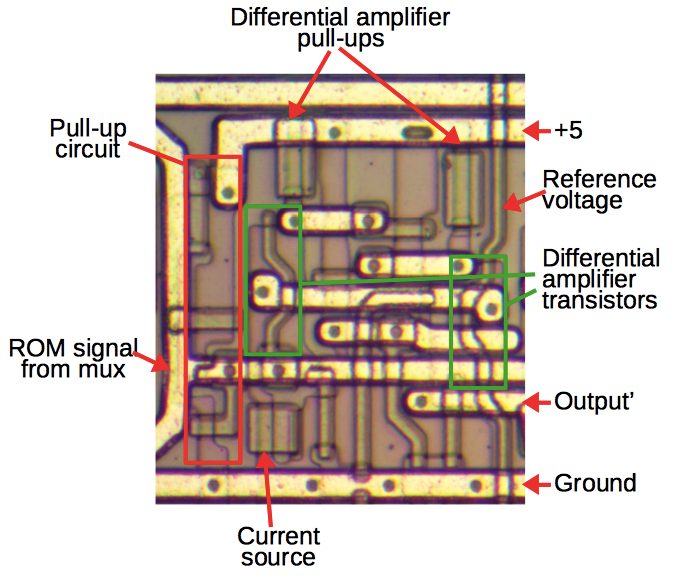 The differential amplifier's current source and pull-up resistors are implemented with depletion-mode transistors. Each output circuit uses three comparators, yielding 24 comparators in total. Circuit generating the three reference voltages. The reference transistors are sized between the ROM's transistor sizes. The oxide layer wasn't fully removed from this part of the die, causing the color swirls in the photo. While you'd hope for the multi-level ROM to be half the size of a regular ROM, it isn't quite that efficient because of the extra circuitry for the comparators and because the transistors were slightly larger to accommodate the multiple sizes. Even so, the multi-level ROM saved about 40% of the space a regular ROM would have taken. 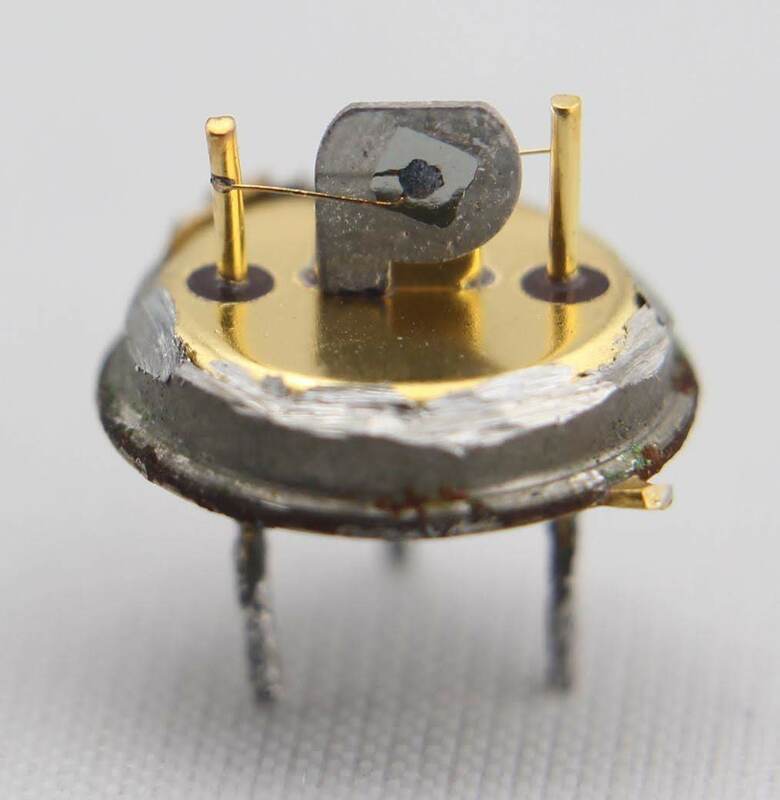 Now that I have determined the structure of the ROM, I could read out the contents of the ROM simply (but tediously) by looking at the size of each transistor under a microscope. But without knowing the microcode instruction set, the ROM contents aren't useful. Surprisingly, the multi-level concept has recently returned, but this time in flash memory. Many flash memories store two or more bits per cell.13 Flash has even achieved a remarkable 4 bits per cell (requiring 16 different voltage levels) with "quad-level cell" consumer products announced recently. Thus, an obscure technology from the 1980s can show up again decades later. I announce my latest blog posts on Twitter, so follow me at @kenshirriff for future 8087 articles. I also have an RSS feed. Thanks to Jeff Epler for suggesting that I investigate the 8087's ROM. 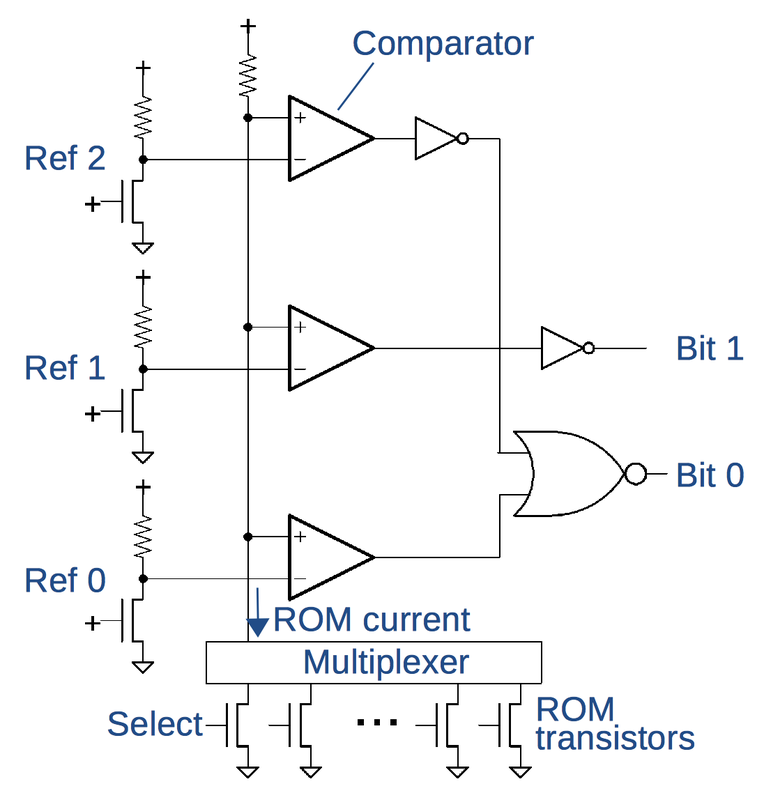 The reason ROMs typically use multiplexers on the row outputs is that it is inefficient to make a ROM with many columns and just a few output bits, because the decoder circuitry will be bigger than the ROM's data. The solution is to reshape the ROM, to hold the same bits but with more rows and fewer columns. 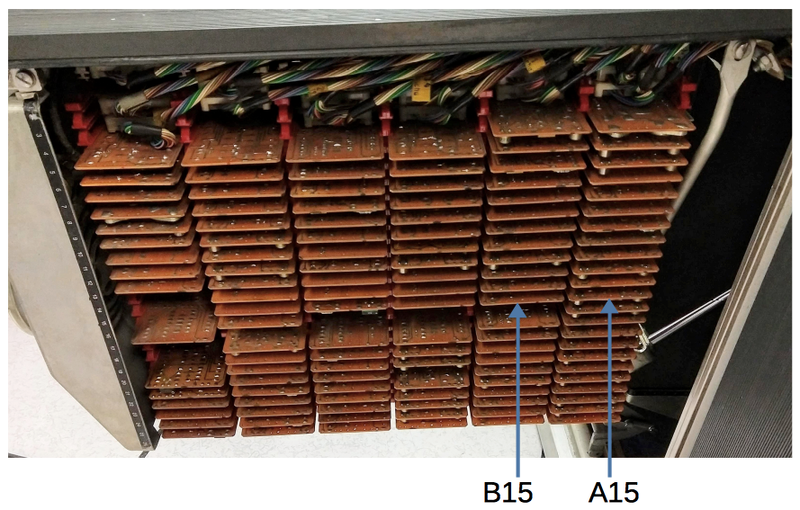 For instance, the ROM can have 8 times as many rows and 1/8 the columns, making the decoder 1/8 the size. 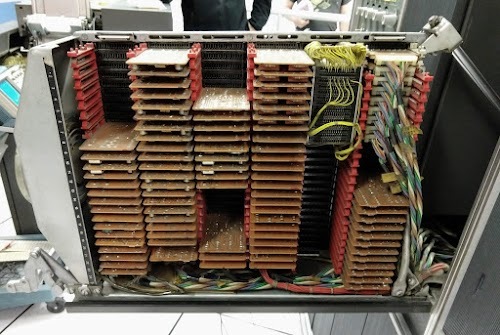 Several other approaches were used in the 1980s to store multiple bits per cell. One of the most common was used by Mostek and other companies: transistors in the ROM were doped to have different threshold voltages. By using four different threshold voltages, two bits could be stored per cell. 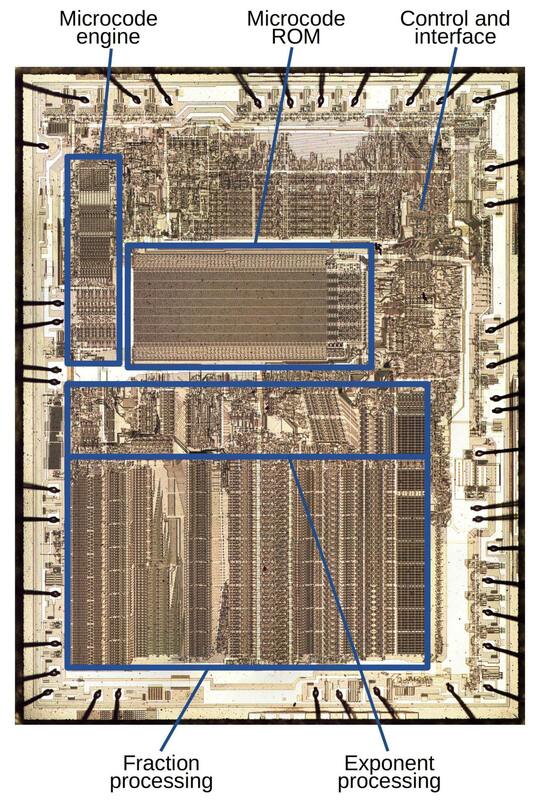 Compared to Intel's geometric approach, the threshold approach was denser (since all the transistors could be as small as possible), but required more mask layers and processing steps to produce the multiple implantation levels. This approach used the new (at the time) technology of ion implantation to carefully tune the doping levels of each transistor. Intel's iAPX 43203 interface processor (1981) used a multiple-level ROM very similar to the one in the 8087 chip. For details, see "The interface processor for the Intel VLSI 432 32 bit computer," J. Bayliss et al., IEEE J. Solid-State Circuits, vol. SC-16, pp. 522-530, Oct. 1981. 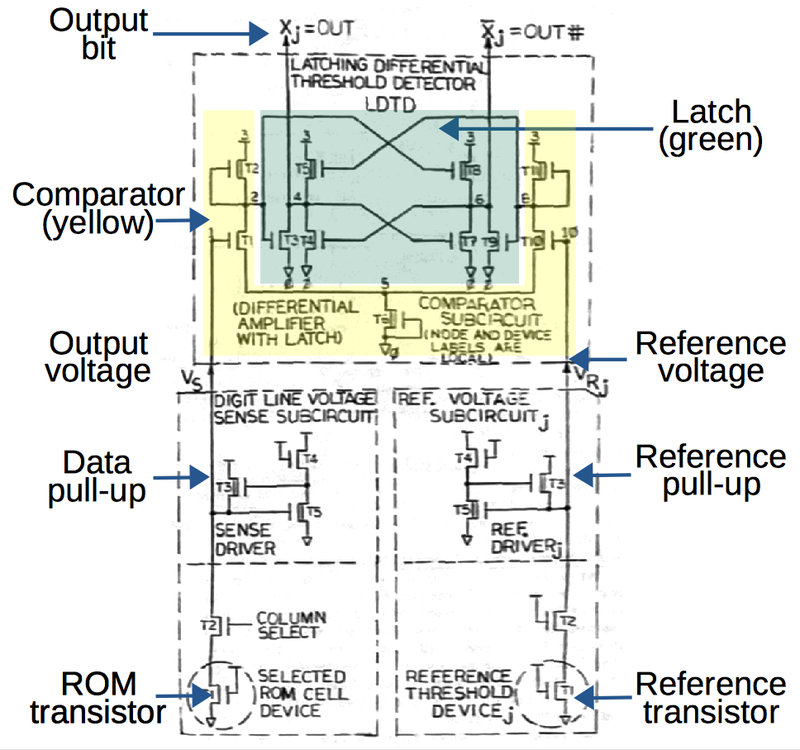 The schematic below (from "Multiple-Valued ROM Output Circuits") provides details of the circuitry to read the ROM. Conceptually the ROM uses a pull-up resistor to convert the transistor's current to a voltage. 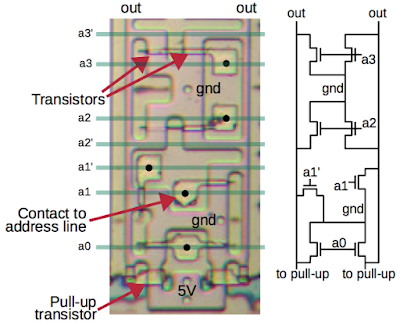 The circuit actually uses a three transistor circuit (T3, T4, T5) as the pull-up. T4 and T5 are essentially an inverter providing negative feedback via T3, making the circuit less sensitive to perturbations (such as manufacturing variations). 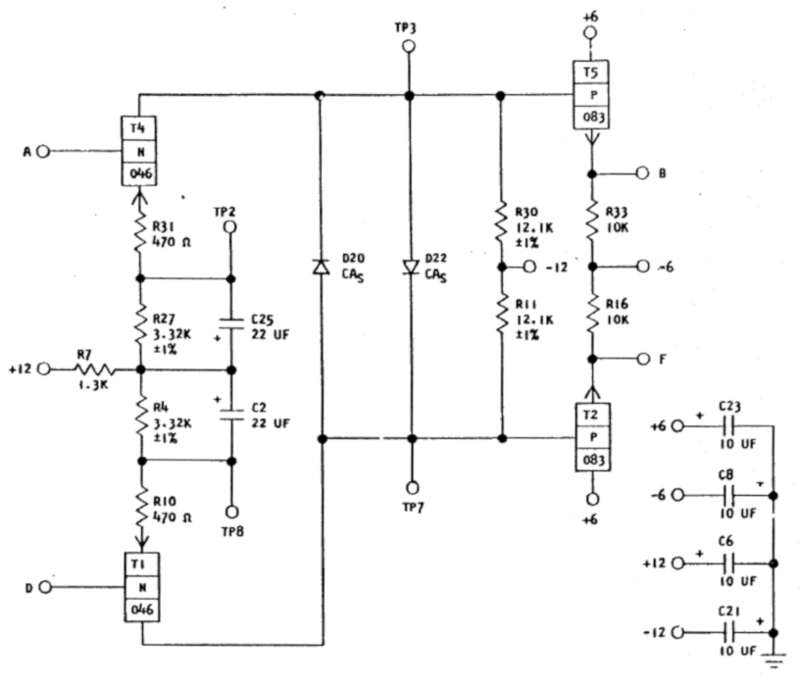 The comparator consists of a simple differential amplifier (yellow) with T6 acting as the current source. The differential amplifier output is converted into a stable logic-level signal by the latch (green). As soon as we finished repairing a printer failure at the Computer History Museum, Murphy's law struck and the card reader started malfunctioning. 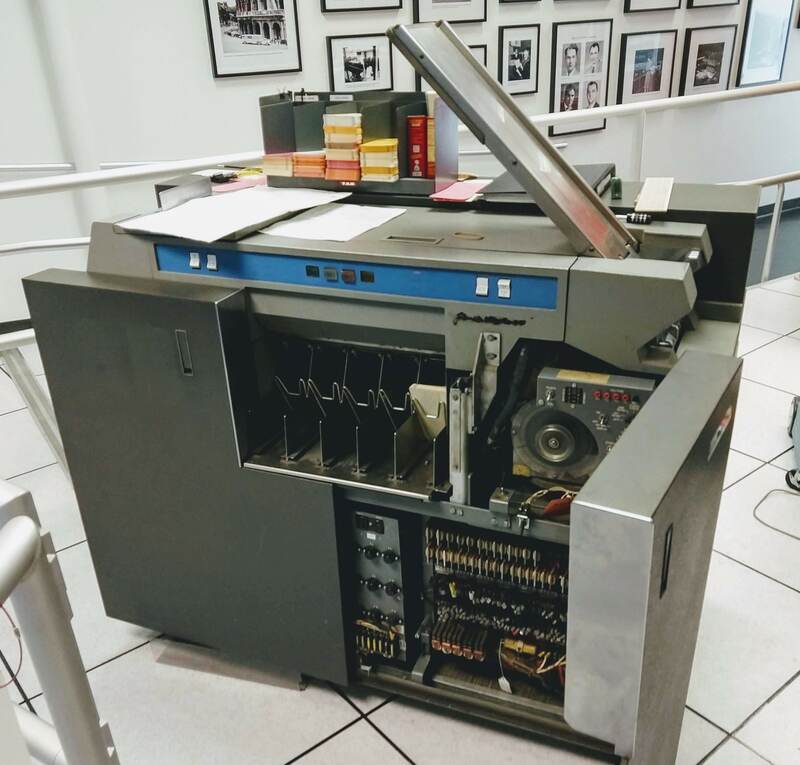 The printer and card reader were attached to an IBM 1401, a business computer that was announced in 1959 and went on to become the best-selling computer of the mid-1960s. In that era, data records were punched onto 80-column punch cards and then loaded into the computer by the card reader, which read cards at the remarkable speed of 13 cards per second. 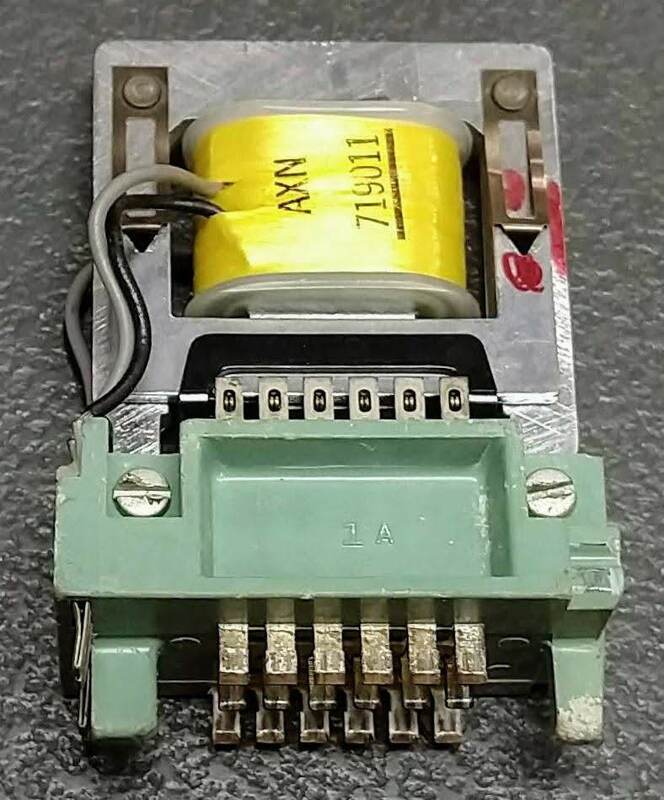 This blog post describes how we debugged the card reader problem, eventually tracking down and replacing a faulty electromechanical relay inside the card reader. 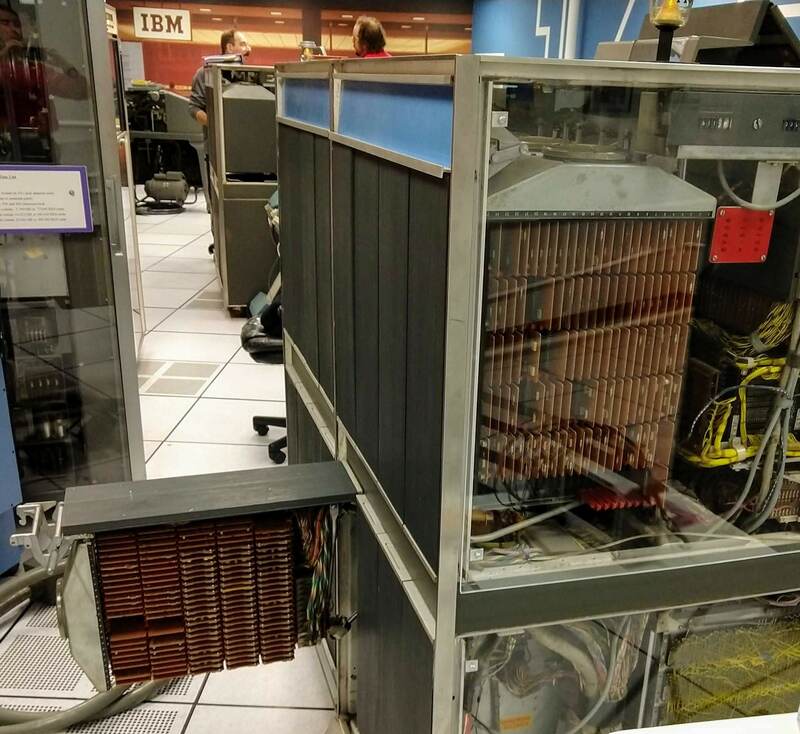 The IBM 1402 card reader at the Computer History Museum. Cards are loaded into the hopper on the right. The front door of the card reader is open, revealing the relays and other circuitry. The card reader malfunction started happening every time the "Non-Process Run-Out" mechanism (NPRO) was used. During normal use, if the card reader stopped in the middle of processing, unread cards could remain inside the reader. To remove them, the operator would press the "Non-Process Run-Out" switch, which would run the remaining cards through the reader without processing them. Normally, the "Reader Stop" light (below) would illuminate after performing an NPRO. The problem was the "Reader Check" light also came on, indicating an error in the card reader. Since there was no actual error and the light could be cleared simply by pressing the "Check Reset" button, this problem wasn't serious, but we still wanted to fix it. 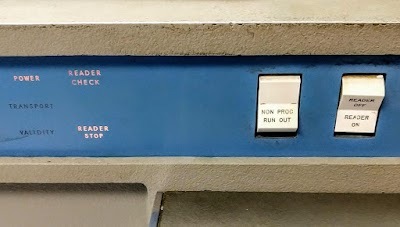 Control panel of the 1402 card reader showing the "Reader Check" error. The Non-Process Run-Out switch is used to run cards out of the card reader without processing them. 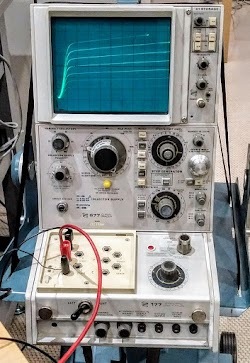 To track down the problem, the 1401 restoration team started by probing the card reader error circuitry inside the computer with an oscilloscope. (The card reader itself is essentially electromechanical; the logic circuitry is all inside the computer.) 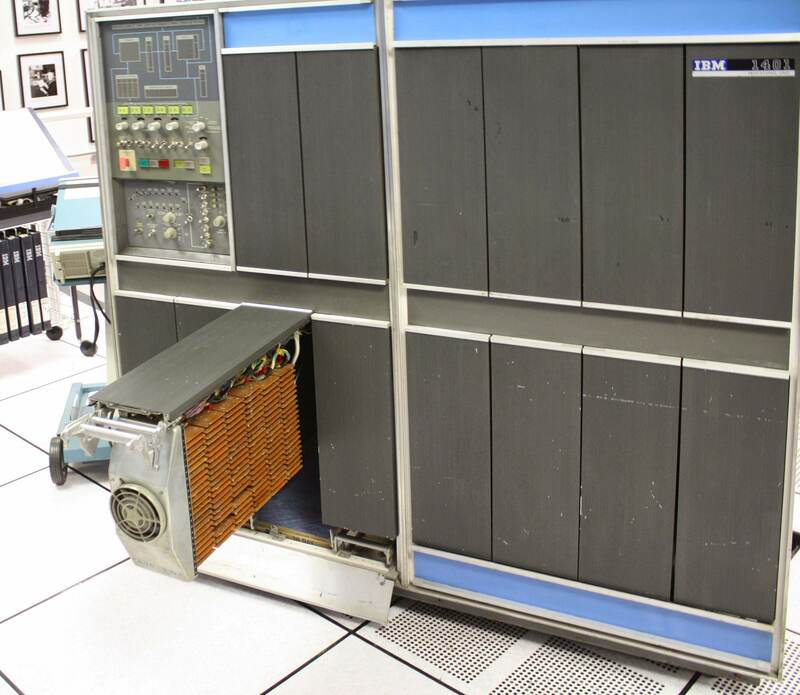 The photo below shows the 1401 computer with a swing-out gate opened to access the circuitry. Finding a circuit inside the IBM 1401 is made possible by the binders full of documentation showing the location and wiring of all the computers circuitry. This documentation was computer generated (originally by a vacuum tube IBM 704 or 705 mainframe), so the diagrams were called Automated Logic Diagrams (ALD). 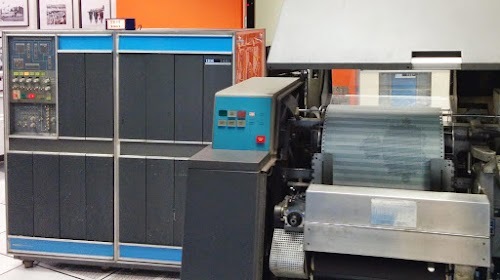 The IBM 1401 with gate 01B4 opened. The yellow wire-wrapped wiring connects the circuit boards that are plugged into the gate. The computer's console is visible on the front of the computer. 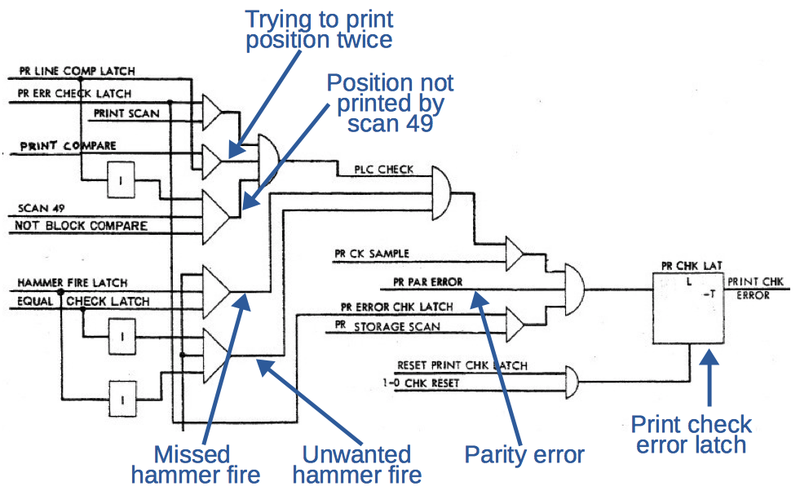 The reader check error condition is stored in a latch circuit; the latch is set when an error signal comes in, and cleared when you press the reset button. 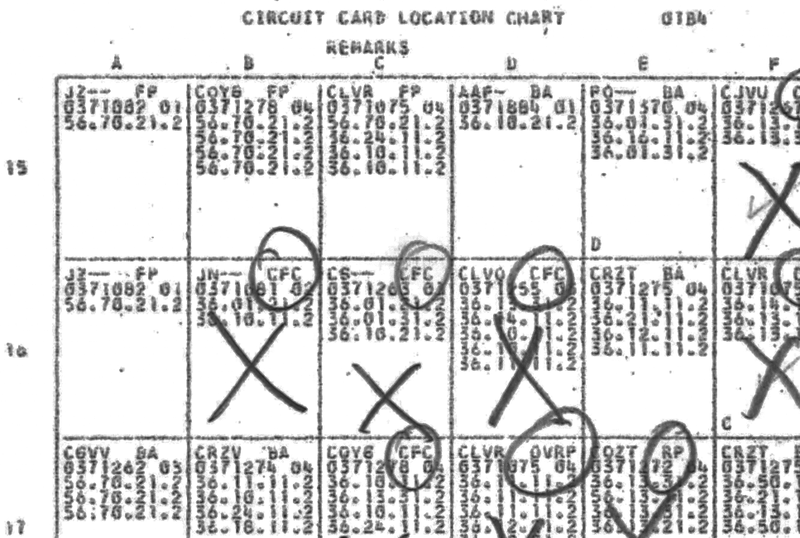 To find this circuit we turned to the ALD page that documented the card reader's error checking circuitry. The diagram below is a small part of this ALD page, showing the read check latch of interest: "READ CHK LAT". 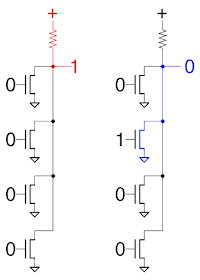 Each basic circuit (such as a logic gate) is drawn on the ALD as a box, with lines showing how they are connected. 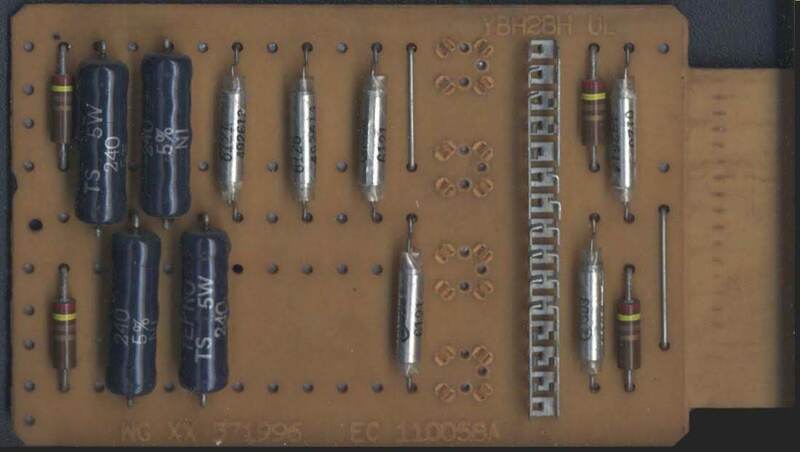 Inside the box, cryptic text indicates what the circuit does and where it is inside the computer. For example, the latch (lower two boxes) is constructed from a circuit card of type CQZV (an inverter) and a CHWW card (a NAND gate). The text inside the box also specifies the location of each card (slots D21 and D24 in gate 01B4), allowing us to find the cards in the computer. Note that the RD REL CHK signal comes from ALD page 56.70.21.2; this will be important later. 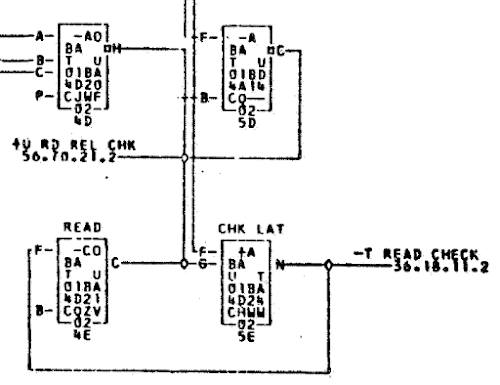 The read check latch circuit, excerpted from the ALD 36.14.11.2. The schematic below shows the latch redrawn with modern symbols. If the RESET line goes low, it will force the inverted output high. Otherwise, the output will cycle around through the gates, latching the value. If any OR input is high (indicating an error), it will force the latch low. 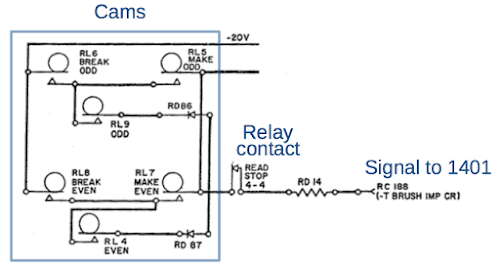 Note the use of wired-OR—instead of using an OR gate, signals are simply wired together so if any signal is high it will pull the line high. 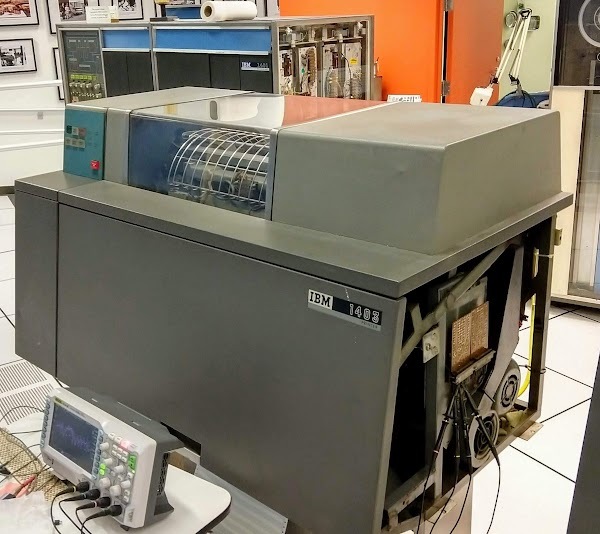 Because transistors were expensive when the IBM 1401 was built, IBM used tricks like wired-OR to reduce the transistor count. Unfortunately, the wired-OR made it harder to determine which error input was triggering the latch because the signals were all tied together. The read check latch circuit redrawn with modern symbols. our documentation didn't include ALD section 56, confirming that this feature wasn't present in our system. 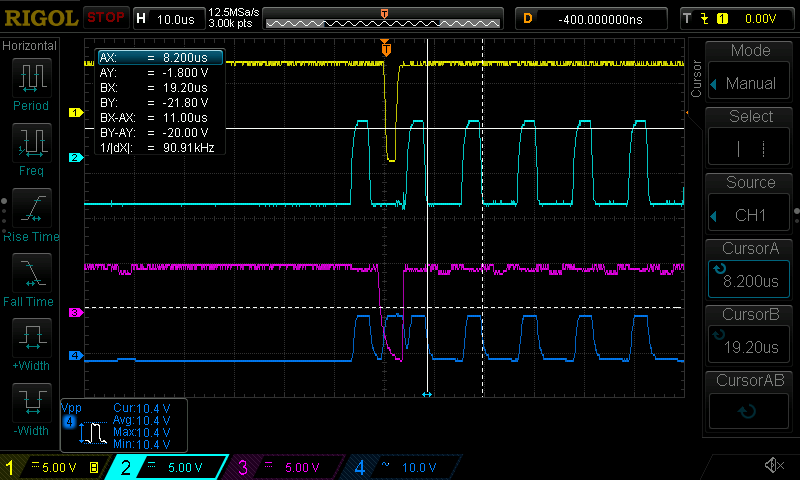 Additional oscilloscope tracing showed a lot of noise on some of the signals from the card reader. 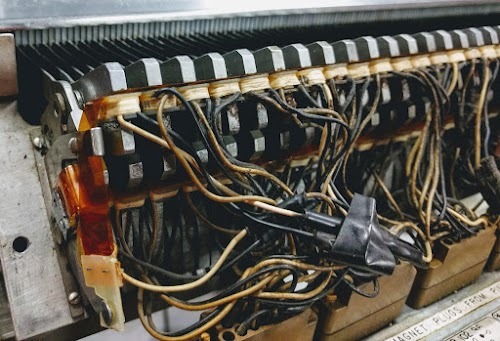 This wasn't unexpected since the card reader is built from electromechanical parts: relays, cam switches, brushes, motors, solenoids and other components that generate noise and voltage spikes. I considered the possibility that a noise spike was triggering the latch, but the noise wasn't reaching that circuit. The plug charts show the type of card in each position in the computer, and the function assigned to it. This is part of the plug chart for gate 01B4. At this point, I was at a dead end, so I took another look at the RD REL CHK signal to see if maybe it did exist. 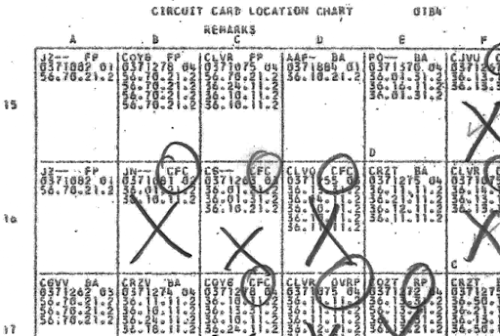 The 1401's documentation includes "plug charts," diagrams that show what circuit card is plugged into each position in the computer. 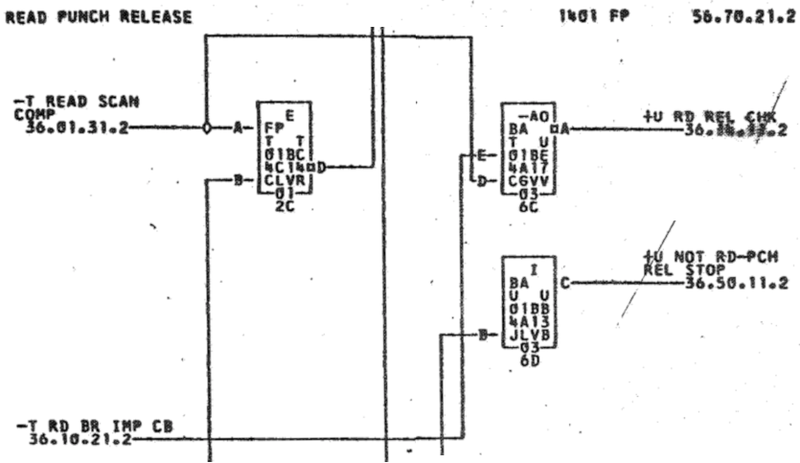 I looked at the plug chart for the card reader circuitry in gate 01B4 (swing-out gate, not logic gate). The plug chart (above) showed cards assigned to the mysterious ALD 56.70.21.2, such as the cards in slots A15-A17 and B15. (The plug chart also had numerous pencil updates, crossing out cards and adding new ones, which didn't give me a lot of confidence in its accuracy.) I looked inside the computer and found that these cards, the Read Punch Release cards generating RD REL CHK, were indeed installed in the computer. So somehow our computer did have this feature. The gate in the 1401 holding the card reader circuitry. Note the cards in positions A15 and B15. The problem was that even though these cards were present in the system, we didn't have the ALDs that included them, leaving us in the dark for debugging. I checked the second 1401 at the Computer History Museum; although it too had the cards for Read Punch Release, its documentation binders also mysteriously lacked the section 56 ALDs. Fortunately, back in 2006, the Australian Computer Museum Society sent us scans of the ALDs for their 1401 computer. I took a look and found that the Australian scans included the mysterious section 56. There was no guarantee that their 1401 had the same wiring as ours (since the design changed over time), but this was all I had to track down RD REL CHK. Simplified excerpt of ALD 56.70.21.2 from an Australian 1401 computer. According to the Australian ALD above, RD REL CHK was generated by the CGVV card in slot A17 (upper right box above). 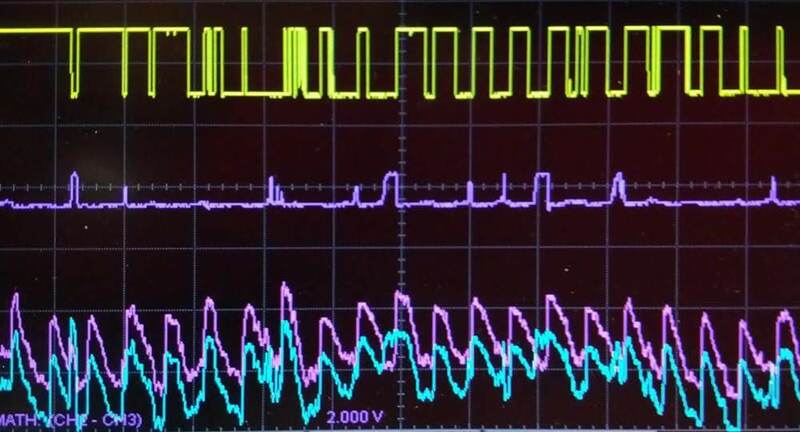 The oscilloscope trace below confirmed that this card was generating the RD REL CHK signal (yellow), but its input (RD BR IMP CB) (cyan) looked bad. Notice that the yellow line jumps up suddenly (as you'd expect from a logic signal), but the cyan line takes a long time to drop from the high level to the low level. Perhaps a weak transistor in a circuit was pulling the signal down slowly, or some other component had failed. 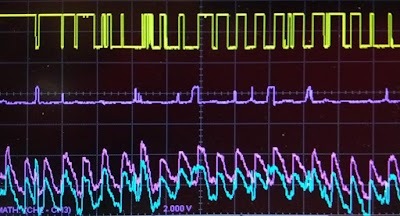 Oscilloscope trace showing the "circuit breaker" signal from the card reader (cyan) and the READ REL CHK error signal (yellow). We looked into the RD BR IMP CB signal, short for "ReaD BRush IMPulse Circuit Breakers". In IBM terminology, a "circuit breaker" is a cam-operated switch, not a modern circuit breaker that trips when overloaded. The read brush circuit breakers generate timing pulses when the read brushes that detect holes in the punch card are aligned with a row of holes, telling the computer to read the hole pattern. The NGXX integrator card contains resistor-capacitor filters. Unlike most cards, this one doesn't have any transistors. Photo courtesy of Randall Neff. We looked up yet another ALD page to find the source of the strangely slow RD BR IMP CB signal. That signal originated in the card reader and then passed through an NGXX integrator card (above). Earlier I mentioned that the signals from the card reader were full of noise. This isn't a big problem inside the card reader since brief noise spikes won't affect relays. But once signals reach the computer, the noise must be eliminated. This is done in the 1401 by putting the signal through a resistor-capacitor low-pass filter, which IBM calls an "integrator". That card eliminates noise by making the signal change very slowly. In other words, although the signal on the oscilloscope looked strange, it was the expected behavior and not a problem. But why was there any signal there at all? Part of IBM 1402 card reader schematic showing the cams (circles) that generate the CB read pulses and the relay that blocks the pulses during NPRO. After some discussion, the team hypothesized that the pulses on RD BR IMP CB shouldn't be getting to the 1401 at all doing a Non-Process Run-Out, since cards aren't being read. The schematic4 for the card reader (above) shows the complex arrangement of cams and microswitches that generates the pulses. 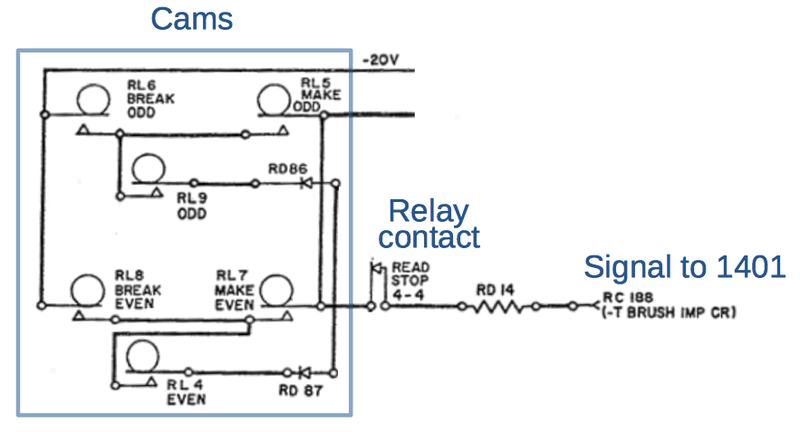 During an NPRO, relay #4 will be energized, opening the "READ STOP 4-4" relay contacts. This will stop the BRUSH IMP CB pulses from reaching the 1401.53 In other words, relay #4 should have blocked the pulses that we were seeing. Frank King replacing a bad relay in the 1402 card reader. The relays are next to his right shoulder. The card reader contains rows of relays; the reader's hardware is a generation older than the 1401 and it implements its basic control functions with relays rather than logic gates. Frank pulled out relay #4 and inspected it.6 The relay (below) has 6 sets of contacts, activated by an electromagnet coil (yellow) and held in position by a second coil. Springs help move the contacts to the correct positions. One of the springs appeared to be weak, preventing the relay from functioning properly.7 Frank put in a replacement relay and found that the card reader now performed Non-Process Run-Outs without any errors. We loaded a program from cards just to make sure the card reader still performed its main task, and that worked too. We had fixed the problem, just in time for lunch. The faulty relay from the IBM 1402 card reader. The team that fixed this problem included Frank King, Alexey Toptygin, Ron Williams and Bill Flora. My previous blog post about fixing the 1402 card reader is here, tracking down an elusive problem with a misaligned cam. The card reader schematic shows that six separate cams were required to generate the RD BR IMP CB signal. The problem is that cards are read at high speed, so rows on the card are read just 3.75 ms apart. Cams and microswitches are too slow to generate pulses at this rate. To get around this, pulses for odd rows and even rows are generated separately. In addition, one set of switches closes for the start of a pulse and a second set opens for the end of a pulse. Needless to say, it is a pain to adjust all these cams so the pulses have the right timing and duration. If this timing is off, cards won't read correctly.